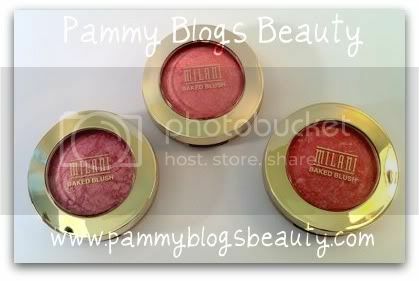 Pammy Blogs Beauty: Milani Baked Blushes: Wow! Love 'em! 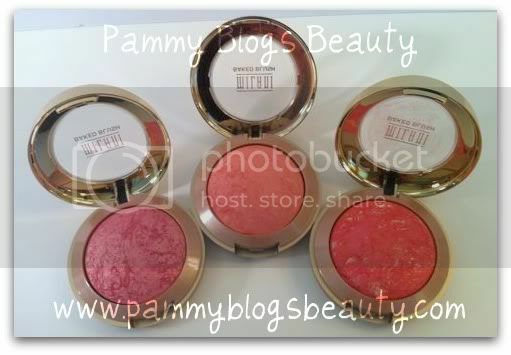 Milani Baked Blushes: Wow! Love 'em! Well, I have stumbled upon a new fav range of blushes! Honestly, I am not sure exactly how long these have been around, but I believe they are very new. Wow! They are totally great!!! If you are looking for high-quality, finely milled, and intensely pigmented blushes at a drugstore price, then these blushes are certainly for you! For swatches and reviews for Milani Baked Blushes in 05 Luminoso, 01 Dolce Pink, and 08 Corallina, then keep reading after the jump! They all are intensely pigmented! I probably have never seen such deep pigmentation in a blush from a drugstore line. Seriously, ever! The closest high end comparison I have are the LORAC baked blushes which feel very similar in texture (and which I totally love too). Quality: No question, these are high-end quality at a value price. The retail between $6-$8 depending on where you are shopping. Texture: These powder of these blushes is so soft and smooth. There is some slight variation in texture across colors but over all these blushes feel lovely and soft. Unlike many other "baked" makeup product that I have tried, you don't have to "scrub" your brush across the product to pick up good color. Honestly, a little goes a long way with these. I just lightly swipe my blush brush across the product, tap off excess and apply with a light hand. These blushes contain shimmer. I know this make be a deal-breaker for some of you. But, I personally like a bit of shimmer in my blush. In the pan, you will see marbleized glitter veins that are quite sparkly. Yet, when the blush is applied to your cheeks the sparkle shimmer effect is surprisingly subtle (considering how sparkly it looks in the pan). But, there is enough shimmer in these products to not need an additional highlighter. You will look glowy enough with these pretty blushes on their own. Seriously, don't let the glittery look in the pan scare you off, these are just lovely on the skin! Packaging: The packaging is sturdy and durable. It is a basic dome shaped blush inside a yellow-gold compact. The pan lifts up to reveal a small mirror and a brush underneath (much like the Physician's Formula packaging, but less bulky than PF). I would prefer the packaging to be slimmer and not include the brush (that I don't use anyway). But, hey that is my only very minor complaint! Let's face it, Colors impact our moods, and these colors make me happy! ;) The range has 8 lovely blush shades and also a bronzer. They are all truly unique and different shades. I am certain there is a blush color in this range for every one's skintone! Okay, I can't resist reviewing my fav of the group first! This was actually the first Milani baked blush that I purchased, and I loved the texture and color so much, that I ended up going back for a couple more shades. Unlike most of the rest of the range, this shade has the least amount of "marbling" in the pan. Now, this isn't the same as the famous Milani Luminous blush from years ago (or that was when I owned it), this one is really a *true* peach shade with an iridescent shimmer. This does not look the least bit orange on my uber-fair neutral-cool skin. It is just a totally lovely and glowy peach. I think this would love lovely on any fair lady. I am so happy that I picked this up! I find that I am continuously reaching for it! I mean, we have a potential HG blush here. I just feel like it is the ideal shade for me! I love wearing this super flattering blush. Ah, yes! There is a Coral blush in this collection. As ya'll may know, Coral is *hot* for Spring/Summer of 2011, so I was thrilled to find a Coral Blush in this collection. Wow, holy pigment!!! I apply this one *very* sparingly as it would be easy to over-do a color this vibrant and luminescent blush on my fair skin. But, when applied carefully, it gives such a beautiful pop of color. Lovely!!! With slightly more iridescent-gold glitter than Luminoso, I feel that the texture is not quite as soft, but almost as soft as Luminoso (and this is probably me over analyzing this *way* too much!). LOL! So, girls in search of a pretty coral blush: check this one out!!! Last, but not least: My most recent purchase! This is a lovely light almost-baby pink with a heavy gold shimmer. Of the 3 Milani Baked blushes, this one applies the most sheer and the most sparkly. Even with the shimmer, this is totally wearable and beautiful on the skin! This is yet another totally flattering and beautiful color in this line. The texture is soft and reminiscent of the same texture as Coralina. So, as you can tell, I really love all of these pretty blushes! I reach for Luminoso the most and it is my current fav of the group, but I really love them all! What a great value and high quality! I highly recommend these and would totally repurchase! I am so happy with these blushes that I would love to explore the rest of the Milani line. What do ya'll like from Milani? @eighteighteight: You should totally try these great blushes! they all look so pretty! I have heard nothing but good things about those blushes! I hope to try some soon! luminoso and dolce pink are the nicest :D! @MyBeautyBunny-Hey Jen!!! :) That is aweseome to hear that Milani is cruelty-free as well! I now like this brand *that* much more!!! XOXO!